OnTrac Shipping - Overnight Delivery in Arizona. Grand Canyon State to the Golden State in Just One Day! Valley businesses depend on speed and efficiency, so why lose time with a slow shipper? Go OnTrac and save a transit day! OnTrac offers a wide array of services to fit your shipping needs. Whether you need next-morning delivery by 8am, or a faster ground shipping alternative, we have a service option for you. Shipping from Phoenix to the Northwest now takes only two days—instead of three—and you can save up to 40% on your bill, too. There really is no better choice for overnight delivery in Arizona. Your Shipping Needs, Our Flexibility. When you need a package delivered tomorrow morning, we have you covered. OnTrac has many options to help you meet the demands of your business. We offer next-day package delivery by 10:30am with our Sunrise Service, as well as next-day delivery by 8am using our priority overnight service, Sunrise Gold. Gain a competitive edge with next-day delivery at ground rates! OnTrac Ground Shipping offers fast and affordable next-day and 2-day ground delivery anywhere in California and the major metropolitan areas of Arizona, Nevada, Oregon, Washington, Utah, Colorado, and Idaho. * Shipments that would take 3-5 business days with national carriers are now guaranteed next day or 2-day with fast, reliable ground shipping in Arizona with OnTrac. Fees and surcharges can represent a large portion of your shipping bill with national carriers. OnTrac keeps costs in check by implementing fewer fess and lower surcharges. See our Ground Service fee comparison. A Drop Box is Just Down the Street. Working late on an important project? Keep going! 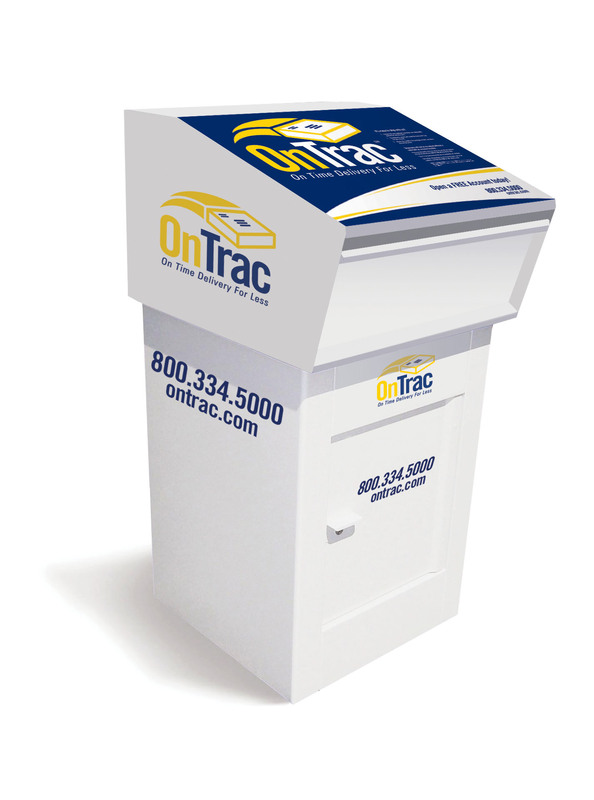 OnTrac has many conveniently-located Drop Boxes throughout our service area with pickup times as late as 10pm! To find the Drop Box nearest you, click on Drop Boxes in the left-hand navigation bar and enter your ZIP Code or search alphabetically by city. We offer maps and step-by-step instructions for Drop Box locations so you can print and email directions. Plus, if you are an on-call customer, use one of our Drop Boxes and save the on-call pickup fee. We are your shipping convenience store, just around the corner and open late! At OnTrac, we care about more than just shipping. That's why we have taken big steps to go green by reducing emissions on our fleet of vehicles, optimizing driver routes, and much more! Plus, without all the additional fees you get from the national carriers, there is more green in your pocket, too. OnTrac is your solution for overnight delivery in Arizona. Save a transit day, and enjoy fewer fees and lower surcharges. Go OnTrac!